Last month I attended an even all about transformation, but there was absolutely ZERO talk of what to eat and how to exercise to transform….it was ALL about the power of our thoughts, taking responsibility, focusing on simplicity and owning our choices. One of the examples of simplicity that struck me the most was the discussion we had of a penny. A penny was passed around to each of us and we were asked, “If I were to give you this one penny and I told you I would double it every day for 30 days OR I was going to give you a $100 bill everyday for 30 days, which would you choose? The penny or the $100 bill? There was a similar example in Jeff Olson’s book, “The Slight Edge”, where a wealthy father offers his two sons a similar choice – a penny that will double everyday or a million dollars. So in either of the two scenarios above, which would you take, the penny, the $100 bill or the million dollars? 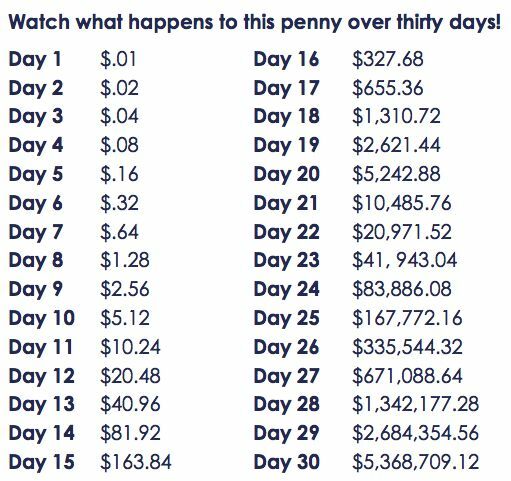 At the end of the 30 days, if you chose the penny, you would have $5,368,709.12. If you chose the $100 bill, you would have $3,000. This perfectly parallels how we get lost in the novelty of new programs, or get caught up in “what she’s doing” instead of doing the simple things consistently. A penny is a teeny tiny currency. A lot of us would walk right past one on the street or if we got some as change, we’d leave it in the little change jar at the store. We discount it’s importance….it’s not THAT big of a deal, right? How often do we do that with things like food choices or exercise? Go overboard on your girl’s trip? “Everyone else is doing it, what’s the big deal? I’m going to start my diet on Monday anyway”. Personally, this was the story of my life for years. All of those little choices that clearly went DIRECTLY agains the goals I said I wanted to reach? They weren’t THAT big of a deal. Me being “stuck” in that all-or-nothing mindset had nothing to do with not *knowing* what I should or shouldn’t be doing. I was stuck because of the excuses I let myself believe….that starting over was somehow easier than not giving up week after week after not doing things “perfectly”. I *thought* that my workouts had to be long and hard and sweaty and leave me feeling sore – or they didn’t count. I didn’t believe that just doing *something* was an option…and one that I would get the most benefit from in the long run. I *thought* the answers to losing those last 5 – 10 pounds were in the new diet everyone was doing…or maybe it was the shakes everyone seemed to be drinking! Maybe it was buying all of my food pre-packaged, counting calories or maybe it was macros! I did all of those things and spent a lot of time and money in the process. When in reality, all I had to do was make simple choices consistently instead of jumping on and off the latest quick fix. I *thought* that those negative thoughts I would let creep in didn’t matter. That I could somehow shame myself into wanting to change. That maybe they were beneficial, that they would somehow motivate me to “have more self-control”. I didn’t recognize the power of those thoughts, even the ones that weren’t “that bad” and how much they negatively affected me. Here’s the deal. Every choice counts. Every thought counts. And they all add up, just like the penny. That penny created wealth with consistency. And YOU can create that same wealth by making small, simple choices consistently that will help you reach your goals and be the person you want to be. Consistency in the simple things, the simple actions and the simple thoughts. These days I realize more than ever that every choice really does count. It’s a chance to invest in your future. It’s a chance to double down on your goals. EVERY CHOICE MATTERS. And usually the smallest choices end up giving us the biggest rewards. We just get caught up looking for the hardest most ridiculous way to reach our goals that we tend to forget that it really isn’t THAT hard. At all. Where are you overcomplicating things? How can you simplify your approach? What are your daily “penny” actions and thoughts and choices that will keep you from starting over and bring you closer to where you want to be? Remember, there is NO change that is too small.